Grate the ginger on the large holes of a box grater. Wrap the grated ginger in a piece of cheesecloth and squeeze over a medium bowl to extract the juice (alternately, press through a tiny sieve). This should result in about 4 tablespoons of juice. Whisk the ginger juice, the ½ cup of olive oil, and the sherry vinegar in a medium bowl to blend. Add the tomatoes, red onion, and half of he basil and toss until well combined. Season to taste with salt and pepper. Set aside for 30 minutes to allow tomatoes to marinate. Add the watermelon to the marinated tomatoes and toss until well combined. Toss the arugula in another bowl with the remaining 1 tablespoon of olive oil and season to taste with salt and pepper. Divide the tomato and watermelon mixture among 6 plates, or arrange in a pretty platter. Garnish with the remaining basil and the black olives. Cut each piece of burrata into 3 pieces. 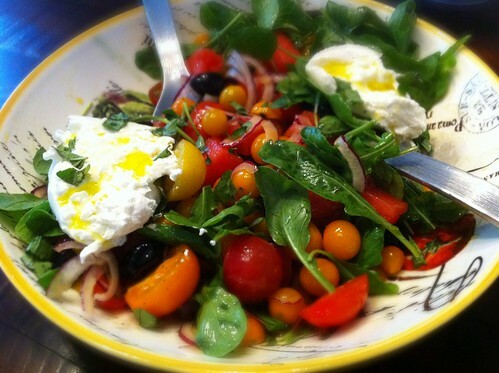 Spoon the burrata evenly over the tomatoes and top with the arugula. Serve immediately.